David Nichols at International Yacht Collection informs me of a $1 million reduction to the price of the 40m motor yacht Brazil. 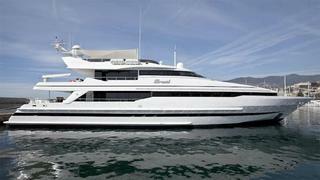 Built by Heesen in 1993, she was refitted in 2008 and comfortably accommodates 10 guests in contemporary style. Her twin MTU 12V 396 TE 94 diesel engines can achieve a top speed of 16.5 knots, with a cruising speed of 12.5 knots. Brazil is now asking $5.45 million, down from $6.45 million.